Do fitness wearables live up to their promise? Wearable fitness trackers like Fitbit and Jawbone are winning over a lot of consumers with their promise that data can enhance health. Last week, Fitbit was the first wearable tech-focused company to go public, raising more than $731 million from 36.6 million shares at their IPO. The IPO valued Fitbit at about $4.1 billion, demonstrating faith in the San Francisco-based company's array of wrist and waist-worn devices, which track a variety of health metrics including steps, movement, calories, heart rate and more. But are wearable fitness trackers worth all the buzz? 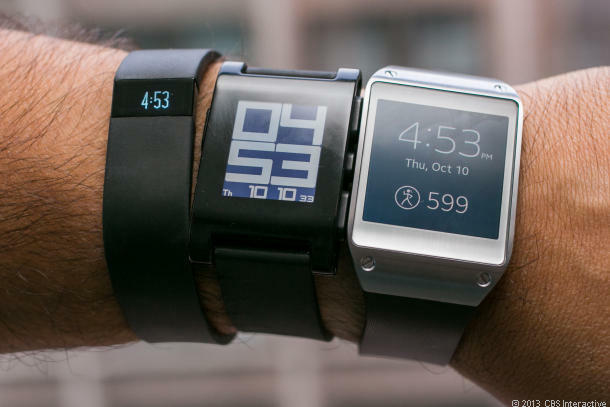 Shane Allen, a personal trainer with personaltrainerfood.com, and Dr. Mitesh S. Patel, Assistant Professor of Medicine and Health Care Management at the University of Pennsylvania, weighed in to help separate the fact from fiction about the effectiveness of wearable fitness tech. The idea of "10,000 steps a day," a goal number supported by various fitness tracker communities, is inspired by a Japanese research study done in the 1960s. Dr. Yoshiro Hatano, lead researcher on the study, estimated that walking 10,000 steps would be enough to burn around 20 percent of daily caloric intake. Even 50 years later this research is still popular: the daily recommendation of 10,000 steps is endorsed by the World Health Organization, the U.S. Centers for Disease Control and Prevention, and the U.S. Department of Health and Human Services. While counting steps isn't a magic cure-all, Allen agrees it's a good step toward personal well-being. "It's good to become aware of how active or inactive you are during the day," he said. "Staying active and tracking what you're doing is important. If you ask anyone how active they are, they usually overestimate." "There's been a lot of hype and attention around these devices, but there's not been a lot of research done," Patel said. This inspired him to lead a team to research the accuracy of fitness wearables versus step-counting smartphone apps. The study found many smartphone apps can measure steps as accurately as fitness trackers. "If you're interested in tracking your steps, you could download an app for free," Patel said. "You can start right away if you have a smartphone." Some more sophisticated trackers promise to do a lot more than just count steps. But questions remain about the accuracy of devices that claim to measure muscle mass, sleep patterns and even pet behavior, which are much more complex and harder to quantify. "The key point is that all of these technologies are going to evolve," Patel said. "But the device alone isn't what's actually going to make us healthy." "Everyone's looking for an easy fix," Allen said. "In reality, there aren't any quick fixes out there." He notes that while wearable fitness technology can help inspire a lifestyle change, the trackers fail to address a huge component of health: what you eat. "[A tracker] puts all the focus on exercise," he said. "At the end of the day, 90 percent of what happens depends on what food you put into your body." He says sustainable weight loss begins with healthy eating. "As long as you're monitoring your progress with anything, that's great," he said. "Just don't let [the tracker] take the place of the food that you're eating." Another challenge to health via wearable tech is personal motivation. Consumer research shows devices often fail to drive long-term engagement with users -- one survey sponsored by the American Council on Exercise found a third of consumers stopped using their tracker within six months of receiving it. Nearly half stopped within a year. "That's not surprising because along with using a wearable device, you have to put it on, charge it and sync it," Patel said. "Those extra things can cause additional challenges." As behavioral scientists have argued, the key to weight loss with wearable fitness trackers is consistent usage. Getting healthy with the help of a fitness tracker requires commitment -- you have to work it into your routine every day. "The technology is exciting but by itself may not be enough to motivate the people who need to be motivated the most," Patel said. Fitness trackers come in both low and high end models, from Xiaomi's $15 Mi Band to the Fitbit Surge at $250. Market analysts say smartwatches that offer health and fitness tracking along with a range of other features -- at a higher price point -- are eventually going to beat out devices that only track fitness. Regardless of price, are fitness trackers worth the investment? "I think fitness tracking is worth it as a part of a bigger routine of healthy eating and exercise," Allen said. "Don't just focus on exercise. Put more energy into eating the right things." Patel said using wearable fitness technology in a social environment will help users get the best out of their devices, whatever the cost. "People tend to do this better when they're with others," he said. "If you have other people or a support network, that certainly helps stay motivated."